So here is the shortcut version. Peel a couple of medium to large sized ulang or freshwater prawns. Use a really small saucepan and melt a LOT of butter in it and add the ulang and keep swirling it about as the butter melts and heats up. Do not let the butter get to a sizzling temperature. When the ulang looks cooked, remove it, add freshly chopped dill to the butter, strain some of the butter onto the cooked ulang and season with some salt if desired and serve with a wedge of lemon. Took less than ten minutes total. The results? The skin was a bit tough, a first sign this wasn’t a good approximation of the heavenly poached version, but when you sliced into the ulang it was soft, delicate, sweet, and pretty darned good for something that took less than 10 minutes to make! 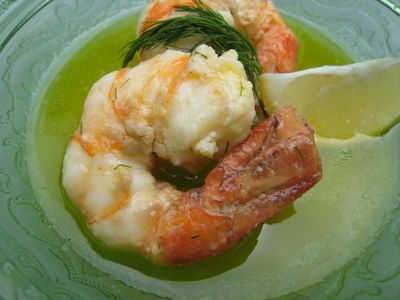 A great appetizer, and sop up all that butter with some toasted bread slices if you want to speed your arterial blockages along… I will eventually attempt a REAL poached lobster or shrimp the Keller way (a bath of hot water and vinegar, an emulsion of water and butter, etc. )… but for now, enjoy this easy and highly edible (say 7.0/10.0) alternative! Soo Simple Yet Looks Delectable!! Don’t you just hate those DUH moments? Later in your life,you will be calling them “senior” moments and you will find yourself working hard to keep them from happening. Nevertheless, this recipe looks great but I’m sure you will do the Keller version better and we are looking forward to it. Thanks a lot. Donâ€™t know whatâ€™s up with butter and lemon when combined together to dress up lobster, shrimp and crabs – it enhances their flavor. In a restaurant set up they use different kind of cooking element to cook shrimps, lobster to perfection with tender juicy finish. It is like poaching it in liquid but kept in a plastic bag container and submerges in water. This is one cooking trick the home chef cannot replicate at home but can come close to flavor. Like steak, steakhouses have high powered grilling element that caramelizes the outside of the steak but keep the inside moist and tender. MM looks good! and waht did you do with the heads of the ulang? Same thing happened to me the first time I cooked ulang, they’re a bit overcooked. I did include the heads when I sauted them in garlic and butter, I cooked them a bit longer than usuall coz I was worried that the heads will be undercook (coz their a bit bigger). I also tried blanching them first in boiling water, then I sauted them in galic and butter mixture, it turned good! Goodluck next time! I can’t wait for your poached lobster recipe! 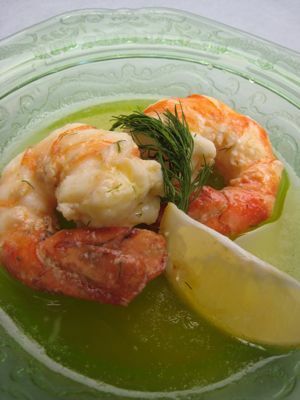 i usually poach shrimps in some 7-up or sprite with their skins and heads. when almost cooked, i peel them, and put them back in the 7-up solution until reduced (almost dry). then add some butter and fry for a minute. simple and delicious! Beautiful pictures, great composition. The shrimps somehow remind me of curled up babies. mc, i think they call the procedure sous-vide, Hung, the recent winner of top chef always use this method of cooking. will try it on no meat friday i bought a couple of pounds of large shrimps which has a stunning blue hue, i think its farm raised though. The Best Pork Barbecue, Ever?? ?